The Sloan-Kettering Institute for Cancer Research (SKI) was established on August 8, 1945. A gift of $4 million from Alfred P. Sloan, Jr., Chairman of General Motors and a trustee on the board of Memorial Hospital, provided the initial funds for the construction of the institute and its early operating costs. Engineer Charles F. Kettering — Director of Research at GM as well as inventor of the key-operated ignition switch and anti-knock gasoline — was the institute’s co-founder. He served as a member of SKI’s Committee on Scientific Policy for many years. From left: Charles Kettering, Cornelius Rhoads, Reginald Coombe, and Alfred Sloan view a plan for SKI in 1945. As conceived by its founders, SKI would be devoted solely to scientific research, and would play a pivotal role in the intellectual life of the cancer center. The New York Times covered the development on its front page. The announcement, which came two days after the bombing of Hiroshima in 1945, noted that like the research program that developed the atomic bomb, research efforts that were “scientifically organized” could make rapid progress — in this case in the fight against cancer. SKI officially opened its doors in 1948. Cornelius P. Rhoads, a pathologist and an early proponent of chemotherapy, was its first director. The initial focus of the institute was a large-scale program to discover cancer-killing chemicals. This massive effort would yield some of the first approved chemotherapy drugs. A second and later focus was on harnessing the immune system to fight cancer, a research area that would bear much fruit in coming years. SKI’s facilities, which began with the building constructed largely with funds from Mr. Sloan’s donation, have grown steadily over the years. The Walker Laboratory, located in Rye, New York, opened in 1959 and housed SKI researchers until the late 1980s. 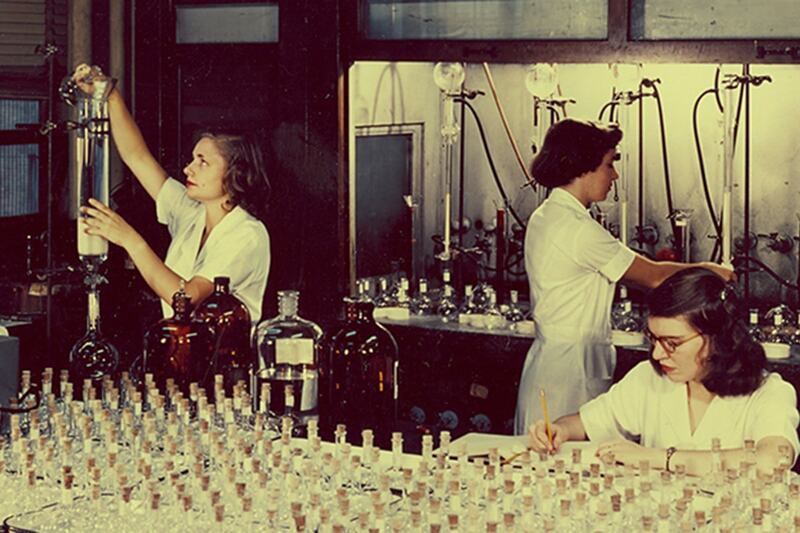 The Kettering Laboratory, named for the Kettering family and located on East 68th Street, was dedicated in 1964. SKI lobby, 1949. The inscription reads: Within These Walls A Few Labor Unceasingly That Many May Live. SKI’s educational mission began in 1950, when the institute signed an agreement with the Cornell University Graduate School of Medical Sciences that enabled students training for their PhD degrees to conduct their research in SKI labs under the guidance of SKI faculty. When it was originally created, SKI was a separate entity from Memorial Hospital, with its own management and its own board, although it was housed immediately adjacent to the hospital buildings on the Upper East Side of Manhattan. The corporate entity called Memorial Sloan Kettering Cancer Center (MSK) was established in 1960. Two decades later, SKI and Memorial Hospital were unified into one institution, with a single president and chief executive officer. SKI remains the experimental research arm of MSK, committed to its original purpose of supporting fundamental science. SKI’s research capabilities expanded greatly beginning in 1980 under the influence of then-MSK President Paul Marks. Dr. Marks and SKI Director Richard Rifkind reorganized programs and recruited many new faculty in novel disciplines such as molecular biology and biophysics. The appointment of Harold Varmus as MSK President in 2000, and his recruitment of Thomas Kelly as SKI Director in 2002, marked the beginning of another important era of expansion. Under their leadership, the breadth and capacity of experimental research grew mightily. In 2004, SKI established its own PhD program in cancer biology through the Louis V. Gerstner, Jr. Graduate School of Biomedical Sciences. SKI nearly doubled the size of its research enterprise with the official opening, in 2006, of a new research complex, named in recognition of a $100 million gift from MSK Board member Mortimer B. Zuckerman. In 2010, Craig B. Thompson became President and CEO of MSK. Cell biologist Joan Massagué became Director of SKI in 2014. Under their leadership, MSK has worked to strengthen collaborations between scientists and clinicians. Together, they created new SKI programs (Chemical Biology, Computational and Systems Biology) and new Collaborative Research Centers (Metastasis and Tumor Ecosystems Center, Center for Epigenetics Research). Their tenure has been marked by an unprecedented level of scientific discovery at the interface between fundamental science and clinical oncology. Since 1945, the Sloan Kettering Institute has championed a scientific approach to solving the cancer problem.